As one of the main rubber bellows manufacturers, ERIKS offers a wide range of rubber bellows of high quality brands such as Simrit. ERIKS and Simrit are longtime technical partners. The two rubber bellows manufacturers joined in a strategic partnership, which is designed to deliver cost savings to the customers. Since the rubber bellows manufacturers joined forces, ERIKS represents the complete Simrit V6 Bellows line. This line consists of many configurations and are produced primarily from Neoprene® (polychloroprene CR). The main advantage of thes e rubber bellows is that neoprene offers good oil and heat-aging resistance. In addition, these rubber bellows protect cylinders and other machine elements against: dust, water and other chemicals. ERIKS does not only supply rubber bellows from stock, but also creates custom made rubber bellows. 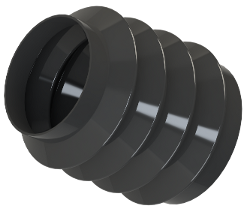 Do you need rubber bellows in a special size or material for your application? Let us know. We like your challenge! Find your local ERIKS rubber bellows manufacturers. Or fill out the "ASK ERIKS" form for more information. To help our customers select the right rubber bellows, we have developed an on-line bellows selector. You select the diameter and overall length of the bellows, or the appropriate V6 part number to select the rubber bellows for your application. ERIKS has most of its bellows in stock at their rubber bellows manufacturers' offices and Service Centres all over the world. For more information about our rubber bellows or tailor-made solutions, please fill out our "ASK ERIKS" form on the right. Go to the overview of our worldwide offices to choose the ERIKS rubber bellows manufacturers office near to you.